Our outing this weekend took us to Central Park, where the girls climbed lots and lots of rocks. 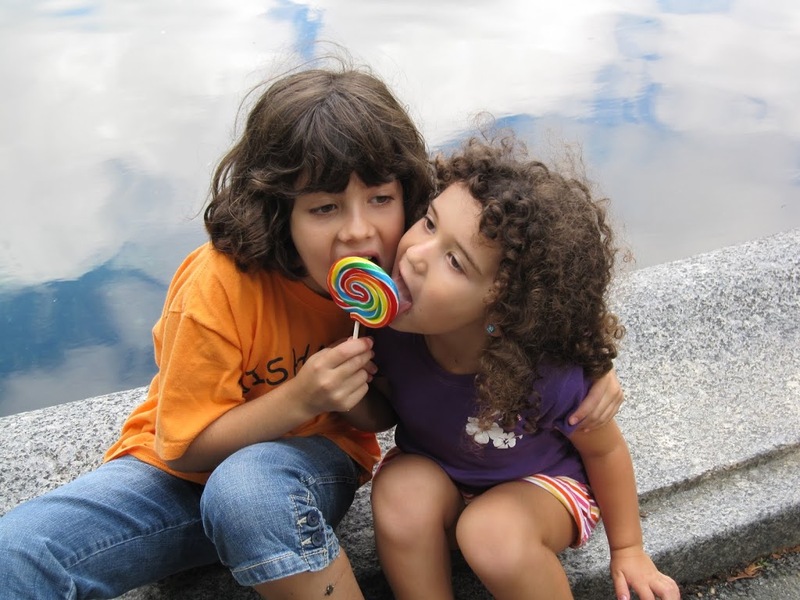 They also shared germs over a disappointingly tasteless, overpriced lollypop. Chloe had me swing her on the tire swing at one of the playgrounds, but I apparently didn’t do it properly. She was nauseous for about 1/2 hour afterwards. After a quick picnic, we continued with our explorations. Ended up at the small lake where the remote-controlled boat aficionados show of their skills. Chloe discovered the joys of cracking open acorns with a rock; Sophie discovered that she could scare pigeons by throwing acorns at them. I’m telling you, between her desire to step on ants, and her newfound talent for using birds as moving acorn targets, we may have a future psychopath on our hands.